A professional tattooer with over 20 years experience, Josh started tattooing at the age of 19 in Los Angeles, California around 1997. Early in his career, he worked in high volume street shops. Including places like Venice Beach and Hollywood Boulevard before transitioning into a more custom design oriented path. After a few years of exploring different genres of tattooing, Josh finally settled on making Japanese style tattooing his primary focus. After 15 years in the industry and over 20 years as an artist, I wanted to open a shop that would exceed clients expectations. Everyone is treated with the utmost respect and given a tattoo they can be proud of. My style is classic Americana or traditional. Simplistic yet expressive with bold outlines and a limited color palette, my designs are representative of tattoos from the 1800's. Strength and timelessness are captured in my pieces. Fernando “Fern” Mardo is an accomplished artist and tattooer who specializes in the American Traditional style. Before beginning his tattoo career 9 years ago, Fernando spent 12 years of his youth focused on perfecting his craft of graffiti and painting trains.Fernando enjoys traveling the world, the perfect pair of Vans, and being as meticulously clean as Danny Tanner! Fernando is available to help you accomplish your tattoo vision. Before the tiger was depicted in Japanese art it first had to be interpreted by Japanese artists. Tigers aren’t native to Japan and the closest ones there are to the Japanese archipelago are in Russia’s Siberian woodlands, the northeastern part of China, and Korea. Regardless, tigers have been displayed on the silk scrolls of traditional Japanese art for centuries. A few tigers had visited Japan before its cultural isolation ended in the late nineteenth century (Meiji Era). Full-grown cats and mewling kittens were given as gifts to warlords and shoguns, but most artists seem to have depicted tigers using imported pelts as reference. Japanese artists would also depict leopards in the mistaken belief they were female tigers. Further more, some artists used house cats as models. If you look closely at Maruyama Okyo’s Sitting Tiger, painted in 1777. His tiger glares with green almond eyes and slitted pupils; an ocular feature common to house cats on sunny days, but not to tigers. Without tigers to draw upon from life, Japanese artists depicted the fearsome cat for spiritual reasons unknown to artists in the west. They borrowed from Taoism, a mystical Chinese philosophy that grew from studying nature. In free-flowing Taoism, Chinese philosophers saw the universe in terms of a symbiotic yin and yang: yang, masculine order, takes the form of a mythological dragon; yin, feminine chaos, the tiger. Japanese Zen Buddhism and Chinese Taoism share some beliefs but Outside of the Chinese zodiac the tiger is not associated with either Buddhism or Shintoism in Japan, however some artists depicted twin dragons and tigers on the sliding doors of Zen Buddhist temples and like the Christian story of Saint Jerome and his lion, Buddhists believed that tigers accompanied long-ago holy men. As a tattoo motif the tiger represents strength and courage, as well as long life. It protects from evil spirits and bad luck, as well as disease. In addition, the tiger is a symbol for the north and for autumn and is said to control the wind. A tiger tattoo protects the wearer from harm and helps them live longer. Its believed that people gain strength from their tiger tattoo, which gives them bravery and confidence. The dragon is arguably one of the most prominent images when it comes to asian culture. For many people the mere mention of China or Japan conjures mental images of these spiky beasts, but where do they originate from and what exactly do they represent? In order to answer this question let’s start with China, its hard to say where the dragon exactly originates from but I think its safe to say that no other culture shows an earlier widespread use of dragons in artwork and architecture. In stark contrast to the European dragon which is usually depicted as a malevolent creature; asian dragons symbolize potent and auspicious powers, particularly control over water, rainfall, hurricanes, and floods. The Asian dragon is a symbol of power, strength, and good luck. The Chinese imperial court used the image of the dragon as a symbol of its own unbridled power. The asian dragon is actually made up of several different animals, a creature commonly referred to as a chimera; usually depicted as having: the tail of a fish, the scales of a carp, the neck of a snake, the belly of a clam, the head of a camel, the claws of an eagle, the paws of a tiger, the ears of a cow, the eyes of a rabbit, the beard of a goat and the antlers of a deer. Under the Han dynasty (206 B.C.–220 A.D.), for instance, the Chinese dragon symbolizing the Emperor, who was viewed as a god at that time, was turquoise. This turquoise Chinese dragon also symbolized the fifth element in the Chinese five elements, the sun, the East and the West. Over time the dragon spread throughout Asia, as it did its physical characteristics changed just a bit. One of main ways to tell where a dragon is from is to count the number of toes it has. Chinese dragons will usually be depicted as having 5 toes whereas the further away it travels from china it will lose a toe, dragons in Korea and surrounding areas have four toes and Japanese dragons will always have three. In terms of how they are portrayed in legends, Chinese dragons are usually given benevolent roles, while a lot of Japanese dragons or Ryu (Japanese for dragon) are not necessarily considered to be malevolent beasts; however they are brutal and powerful forces of nature that transcend good or evil. As a side note, the very concept of good and evil is completely different from the way we view it in western culture. In order to better understand this as westerners we have to step outside our Judeo-Christian perspective and remember that Japanese culture is spawned out of a mix of confucianism, shinto, and buddhism with nature taking center stage. Nature isn’t good or evil, it just is what it is, sometimes fruitful and comfortable and sometime harsh and unforgiving, but you cant blame nature for being nature. We could delve into this more but thats a whole other subject. Some of the first appearances of dragons in Japanese mythology were in the Kojiki (680 AD) and Nihongi (720 AD).The Kojiki, also known as the Records of Ancient Matters or Furukotofumi, is a collection of various myths related to Japan’s four home islands. The Nihongi, which is also referred to as Nihon Shoki or The Chronicles of Japan, serves as a more detailed and elaborate historical record than the Kojiki. 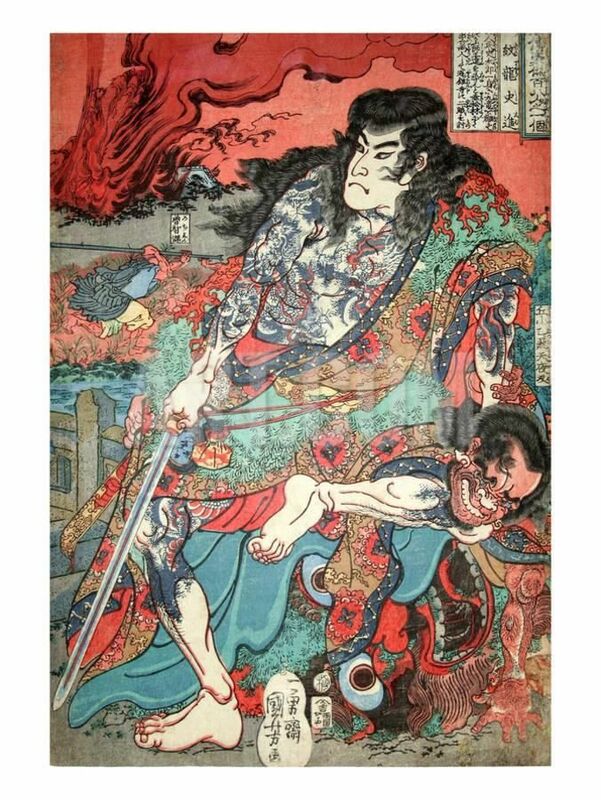 As tattooing in Japan began to flourish around the early 1800’s bigger and more complex tattoo designs began to emerge. It was only a matter of time before dragons started making their appearance in horimono (Japanese body suit tattooing). Since the dragon is most commonly associated with water, the ryu motif become popular among Edo’s firefighters and worn as a talisman to protect against being burned. One of the biggest contributions to the popularity of tattooing in early Japan was a novel known as the Suikoden. Countless Numbers of young men were getting the same tattoos as some the characters in the Suikoden in an attempt to emulate the brave anti-heroes depicted in the story. One major character in the Suikoden goes by the name Kumonryu Shishin (or 9 dragon Shishin) and is described as having a body suit tattoo consisting of, you guessed it, 9 dragons. Dragons in Japanese culture are not a mythical creature but a representation or a symbol, they are the anthropomorphic manifestation of a terrible and powerful heavenly force, conversely the tiger is the most powerful earthly force, they are counterparts, yin and yang. To this day the dragon continues to be one the most widely used and powerful images in tattooing, after 20 years of tattooing it still remains one of my favorite images to draw and or tattoo.